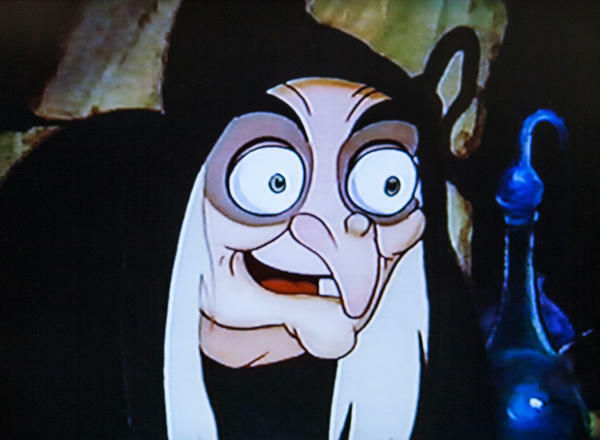 Disney's Snow White has a scene in which the beautiful queen/stepmother turns into an old hag. Scholar Maria Tatar says it's "probably more frightening for adults than children because it compresses the aging process into about 20 seconds." Russia's Baba Yaga has been giving Eastern European children insomnia for centuries. 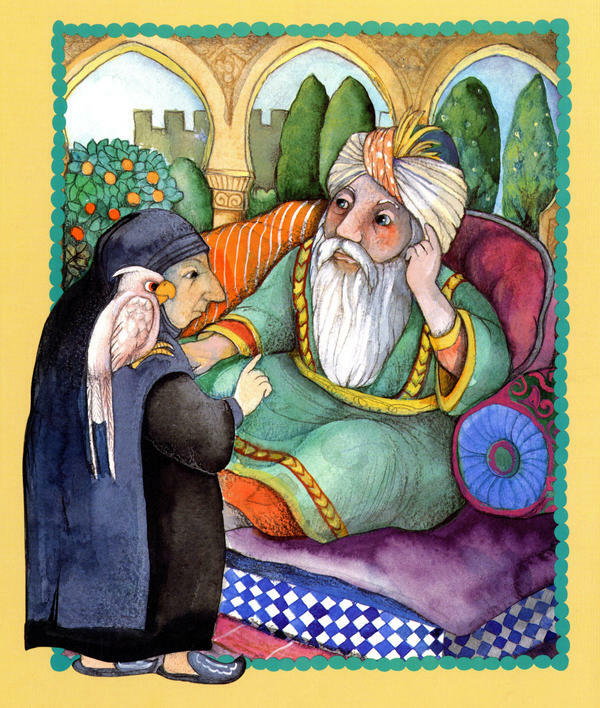 In The Happy Man's Tunic, an old woman (with a white parrot) helps save a caliph's son after he becomes seriously ill.
Reprinted with the permission of Atheneum Books for Young Readers, an imprint of Simon & Schuster Children's Publishing Division from "Tales Our Abuelitas Told" by F. Isabel Campoy and Alma Flor Ada. Illustration copyright 2006 by Viví Escrivá. Fear old women in fairy tales. For as long as people have been telling stories, crones have been scaring the wits out of children. But why does the face of evil so often belong to an old woman? Typecasting is one explanation. "What do we have? Nags, witches, evil stepmothers, cannibals, ogres. It's quite dreadful," says Maria Tatar, who teaches a course on folklore and mythology at Harvard. Still, Tatar is quick to point out that old women are also powerful — they're often the ones who can work magic. "I always look to the Disney film Snow White and that charismatic, wicked queen who is down in the cellar with her chemistry set. There's a sequence in which she turns from a beautiful, charismatic, wicked queen into an old hag," Tatar says. "I think that's a scene that is probably more frightening for adults than children because it compresses the aging process into about 20 seconds." The queen poisons Snow White so she'll sleep forever, and other characters are just as wretched. The old lady in Hansel and Gretel wants to roast children in her oven and the witch in The Little Mermaid cuts out Ariel's tongue. Tatar says old women villains are especially scary because, historically, the most powerful person in a child's life was the mother. "Children do have a way of splitting the mother figure into ... the evil mother — who's always making rules and regulations, policing your behavior, getting angry at you — and then the benevolent nurturer — the one who is giving and protects you, makes sure that you survive." Veronique Tadjo, a writer who grew up in the Ivory Coast, thinks there's a fear of female power in general. She says a common figure in African folk tales is the old witch who destroys people's souls. As Tadjo explains, "She's usually a solitary woman. She's already marginal. She's angry at something — at life, or whatever — and she will 'eat' — that's the expression — people's souls, in the sense that she's going to possess people and then they die a terrible death. And everybody knows it's the witch; it's the old woman." Still, they're not all bitter and malicious hags. Old Mother Hubbard might not be the brightest bulb, but she does try very hard to please her dog. Elderly women in folk tales often use their knowledge and experience of the world to guide the troubled protagonist. Tadjo points to the Kenyan story "Marwe In The Underworld" about a girl who commits suicide by drowning herself because she feels she has failed her parents. Marwe enters the Land of the Dead where she meets an old woman. "That old woman teaches her quite a lot of things," Tadjo says. "And also, when Marwe starts longing for the world of the living, she helps her go back to the surface, if you want, with a lot of riches. And we understand that Marwe has been rewarded for her goodness." In other words: Do your chores and you'll be rewarded. The point of these ancient tales, no matter what continent they come from, may have been to scare children into behaving. 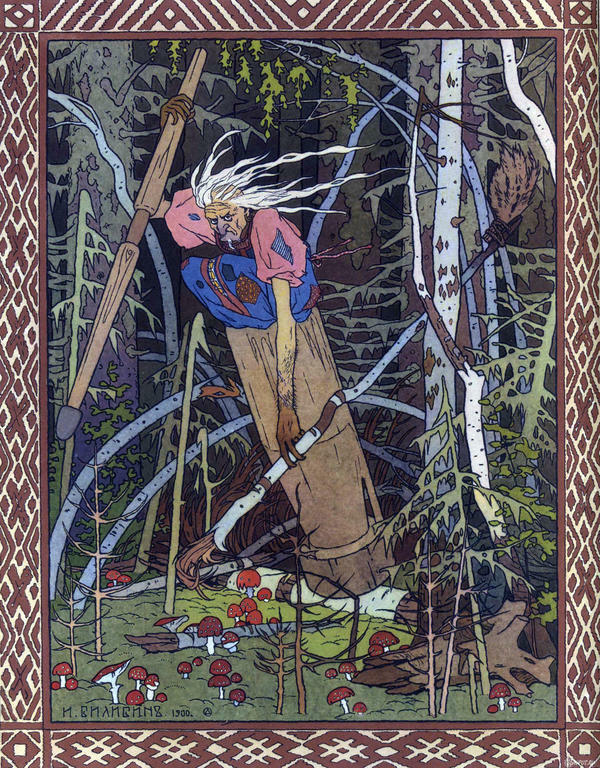 Perhaps the scariest old woman character — the monstrous Baba Yaga — comes from Russia. She's bony with a hooked nose and long, iron teeth. Her hut stands on chicken legs and she kidnaps children and eats them. Safe to say Baba Yaga has been giving Eastern European children insomnia for centuries. In one interpretation, a mean stepmother sends the young girl Vasilisa to Baba Yaga's hut in the woods to get a candle. The girl is sure she's being sent to her death. Baba Yaga forces her to cook and clean, and Vasilisa does everything she's told. In the end, the old crone gives her what she needs and sends her home. "You see this kind of dual face of the hag," Maria Tatar says. "On the one hand: cannibalistic, aggressive, threatening. And on the other hand: sometimes intervening to make sure that there is a happily ever after." There's that power again. In Japanese folklore, the Yama Uba is an equally ambiguous old woman. She's a mountain witch who, like Baba Yaga, lures people into her hut and eats them. But she'll also help a lost traveler. Noriko Reider is a professor at Miami University of Ohio who's done extensive research on Yama Uba stories. "She brings fortune and happiness," Reider says. "She can also bring death and destruction for those who are not very good." There's a theory that the Yama Uba — or Yamauba as she's sometimes called — was inspired by a terrible famine in Japan. Elderly parents were taken into the mountains to die so that others in the family would have more to eat. The Yama Uba is the hungry demon born from this practice. According to Cuban-American writer Alma Flor Ada, that would never happen to the kind abuela. "In our culture, grandmothers are very important." Ada is co-author of Tales Our Abuelitas Told, which includes a story about a caliph's son who becomes seriously ill. After "all of the best physicians in the land" fail to cure him, the caliph sends his messengers searching for help. Then one morning, an old woman arrives with this advice: To get well, the prince must wear the tunic of a man who is truly happy. And of course it works. Ada says that in Hispanic culture old women are multitalented. "They tend to be the ones who keep the family together, who pass on the traditions, who know the remedies that would cure the different illnesses. So it's not surprising that she would appear in the popular tales." In other words, old women in fairy tales and folklore practically keep civilization together. They judge, reward, harm and heal; and they're often the most intriguing characters in the story. MONTAGNE: Fear the old woman in fairytales. MONTAGNE: For as long as people have been telling stories, crones have been scaring the wits out of children. But why does the face of evil so often belong to an old woman? Aging is the topic we're exploring in our series The Changing Lives of Women, as NPR's Elizabeth Blair reports. ELIZABETH BLAIR, BYLINE: Talk about typecasting. MARIA TATAR: What do we have? Nags, witches, evil stepmothers, cannibals, ogres - it's quite dreadful. BLAIR: Dreadful but also powerful, says Maria Tatar, who teaches a course on folklore and mythology at Harvard. It's often the old woman who can work magic. TATAR: I always look to the Disney film "Snow White" and that charismatic, wicked queen who is down in the cellar with her chemistry set. LUCILLE LA VERNE: (As the queen) Now a formula to transform my beauty into ugliness, change my queenly raiment to a peddler's cloak. TATAR: There's a sequence in which she turns from a beautiful, charismatic, wicked queen into an old hag. LA VERNE: (As the queen) To age my voice, an old hag's cackle. (Cackling). TATAR: I think that's a scene that is probably more frightening for adults than children because it compresses the aging process into about 20 seconds. BLAIR: The old woman poisons Snow White so she'll sleep forever. The old lady in "Hansel And Gretel" plans to roast the children in her oven. The old sea witch in "The Little Mermaid" cuts out Ariel's tongue. Old women villains are especially scary, says Tatar, because historically, the most powerful person in a child's life is the mother. MARGARET HAMILTON: (As Miss Gulch) I'll get you my pretty, and your little dog too. (Cackling). TATAR: And then the benevolent nurturer, the one who protects you, makes sure that you survive. BILLIE BURKE: (As Glinda) Are you a good witch or a bad witch? BLAIR: Glinda from "The Wizard Of Oz" even looks younger. BURKE: (As Glinda) Only bad witches are ugly. VERONIQUE TADJO: I think there's a fear of the power of women. BLAIR: Veronique Tadjo is a writer who grew up in the Ivory Coast. She says a common figure in African folktales is the old witch who destroys people's souls. TADJO: She's usually a solitary woman. She's already marginal. She's angry at something, at life or whatever. And she will eat - that's the expression - people's souls. Then they die a terrible death, and everybody knows it's the witch. It's the old woman. BLAIR: Other old women use their knowledge and experience of the world to do good. Take the African story "Marwe In The Underworld," about a girl who commits suicide by drowning herself because she feels she's failed her parents. Marwe enters the land of the dead, where she meets an old woman. Again, writer Veronique Tadjo. TADJO: When Marwe starts longing for the world of the living, she helps her go back to the surface, if you want, with a lot of riches. And we understand that Marwe has been rewarded for being a good child. BLAIR: Because she did her chores. The point of these ancient tales, no matter what continent they come from, may have been to scare children into behaving. And one of the scariest old women of all is from Russia. BLAIR: Baba Yaga is monstrous. BLAIR: With a hooked nose and long iron teeth. BLAIR: Her hut stands on chicken legs. Skulls decorate the fence posts. Baba Yaga has been giving children in Eastern Europe insomnia for centuries. She kidnaps and eat them. This is the music composer Modest Mussorgsky wrote for her. BLAIR: In one story, a mean stepmother sends the young girl Vasilisa to Baba Yaga's hut in the woods to get a candle. The girl is sure she's being sent to her death. Baba Yaga forces her to cook and clean. Vasilisa does everything she's told. In the end, the old crone gives her what she needs and sends her home. There's that power again. Maria Tatar. TATAR: You see this kind of dual face of the hag - on the one hand cannibalistic, aggressive, threatening, and on the other hand, sometimes intervening to make sure that there is a happily ever after. BLAIR: In Japanese folklore, there's an equally ambiguous old woman. Yamauba is a mountain witch who lures people into her hut and eats them. But she'll also help a lost traveler. Noriko Reider is a professor at Miami University of Ohio. NORIKO REIDER: She brings fortune and happiness. She can also bring death and destruction for those who are not very good. BLAIR: There's a theory that the Yamauba was inspired by a terrible famine in Japan. Elderly parents were taken into the mountains to die so that others in the family would have more to eat. The Yamauba is the hungry demon born from this practice. That would never happen to the kind abuela. ALMA FLOR ADA: In our culture, grandmothers are very important. BLAIR: Cuban-American writer Alma Flor Ada is the co-author of "Tales Our Abuelitas Told Us." ADA: They tend to be the ones who keep the family together, who pass on the traditions, who knows the remedies that would cure the different illnesses. And I think that in some cases, there is that little hidden moral there that hey, you better behave well. BLAIR: In other words, old women in fairytales and folklore practically keep civilization together. They judge, reward, harm and heal. They're often the most intriguing characters in the story. Elizabeth Blair, NPR News. MONTAGNE: Now, we all know a lot of intriguing grown women who are keeping civilization going. They're your grandmother, your neighbor, your boss or that historical woman you wrote about in a college paper. Today we're launching an Instagram project to make older women more visible. Post a photo of a woman a generation older than you and tell us why you admire her. Use the hash tag #grownladycrush. Your photos and stories could appear on npr.org. Transcript provided by NPR, Copyright NPR.